Arunachal Pradesh Chief Minister Pema Khandu said that the present government will try to solve all pending issues stating that present team is ready to face any problems and will not run away from it. The 2-day BJP State Executive Meeting concluded today here at Kalawangpo Hall. Chief Minister Pema Khandu today in his concluding speech said the present government will try to solve all pending issues stating that present team is ready to face any problems and will not run away from it. He said most issues the state faces today has been inherited from previous governments. On the ongoing PDS issue in the state, the Chief Minister said the matter will be handed over to CBI or any central investigation agency for investigation into the alleged scam. He said the state government is bearing the past liabilities of PDS payment and is forced to pump funds from development heads severely impacting the resource scarce state. He said the state government is yet to get refund of more than Rs 500 crore from govt of India paid to PDS contractors. On Chakma-Hajong refugee issue, the CM said though it’s a mess created by Congress party, the BJP party in the state is taking steps to solve it. He said following the Supreme Court order to grant citizenship to these refugees, 2000 applications were received, however, none qualified for citizenship. He said it’s the centre to decide on citizenship of these refugees, but the state government is firm not to allow these refugees into the state without ILP. He further said no land rights or any rights enjoyed by the tribals of Arunachal will be accorded to these refugees. 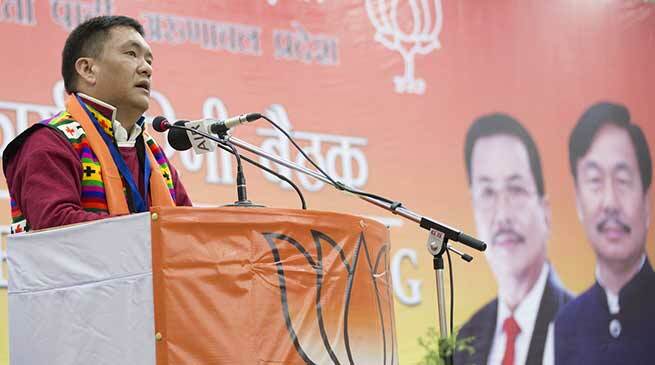 He also said that there can be no third type of citizenship where a non Arunachali could enter the state without ILP. On Tibetan refugee, the Chief Minister said the issue cannot be mixed with other refugee issue. He said Tibetans are not demanding citizenship. Secondly, the basic facilities of water, electricity, roads, PDS supply are already extended to Tibetan refugee settlement camps in Arunachal. It is the govt of India that decided to extend these facilities to all states wherever these refugees are settled through Tibetan Rehabilitation Policy (TRP). He said the TRP policy was to be adopted by previous governments but couldn’t because of the political tussle in the state. He said the policy will only be adopted in consultation with all indigenous community and student bodies and any objectionable matters will be omitted or modified. The objectionable matters in TRP are the grant of land lease and govt jobs to Tibetan refugees. The Chief Minister said the present population of Tibetans in Arunachal is around 7000, which is decreasing every year. Many Tibetan families are being offered jobs and settlement in developed countries and hence they are leaving their settlement camps. On land possession matter, the Chief Minister said the LPC will be considered as deemed ownership for the banks to recognize it as ownership over land for grant of loans. He said the matter will be brought in the November assembly session. He also said the government is slowly doing away with Letter of Credit (LOC) system and introducing public finance management system (PFMS). Under this system, all funding from centre will come to PFMS portal where it will be wired to respective PFMS department accounts. This will give away with paper works that invites corruption. Earlier Power Minister Tamiyo Taga spoke on the Mission 2019 and UD Minister Nabam Rebia on Vision Arunachal. This was followed by Presidential remark by State BJP President Tapir Gao.